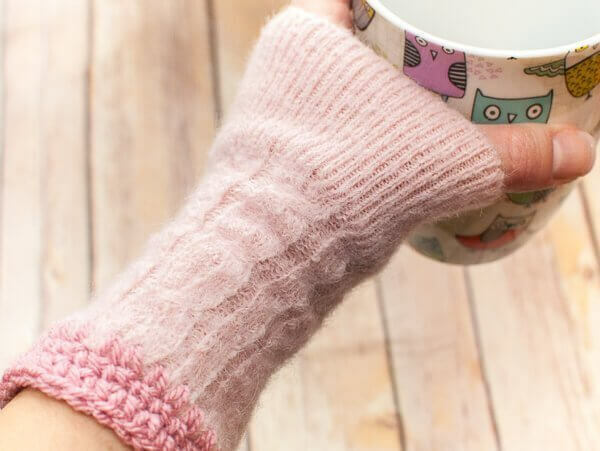 Today I am going to show you how to make wrist warmers from an old sweater … and you don’t even have to know how to knit and crochet to make them! I thought of this after my well meaning husband decided to help me out by doing some laundry, including my cashmere sweater. Well, needless to say it wouldn’t have even fit my daughters after it came out. But I really liked the felted look of the fabric and wanted to salvage it in some way (if you want to read more about what felting is and why it happens, click here). Since the only part of my body that could still fit into it was my hands … wrist warmers it was! To make the wrist warmers, I cut the arms off my sweater at about the mid-forearm. You can cut yours at whatever length you prefer. Since my sweater was so felted, I didn’t really have to worry about the pieces unraveling. But if you are using a regular old unfelted sweater, you might want to fold the cut edge under and stitch around to keep it from unraveling and to finish off the edge nicely. That’s it! You don’t even have to do anything else unless you would like a little extra embellishing or trim. When you are stitching around to prepare your edge try to work in a multiple of 4. Click here to reference Crochet Abbreviations or here to reference Crochet Stitch Symbols. Shell edging: *1 sc, skip 1, 5 dc in next, skip 1, repeat from * around. Pretty fun, huh. And a great way to get another life out of an old sweater that would otherwise be thrown away. 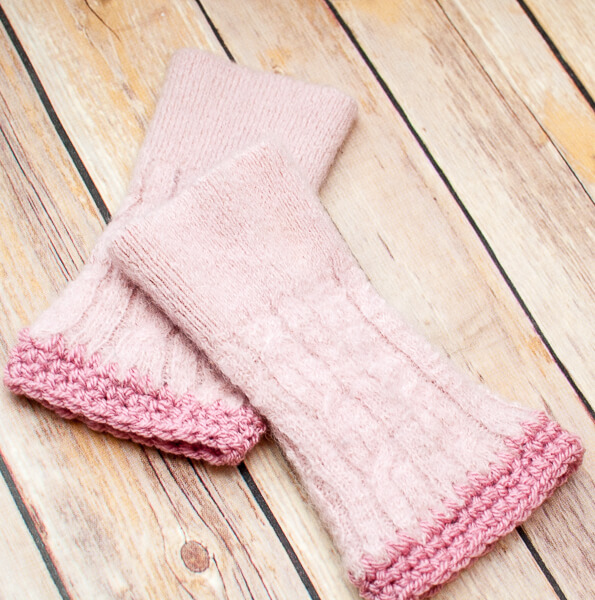 This is such a great way to upcycle an old sweater…I LOVE the pink! GORGEOUS! Kara, this is a fantastic upcycle idea! Thank you for sharing. You’ve inspired me to dig through my stash of never-worn sweaters. Great idea to make the wrist warmers! Take the idea further and make a cashmere throw. Cut large squares/rectangles and crochet around the edges. Sew together (you will need some from other cashmere sweaters/ scarves. You might even be able to incorporate the recycled cashmere scraps into your wool felting projects??? Just a few thoughts. I enjoy reading your blog ideas. Wow!! That’s a great idea! !